At Town Meeting on December 3, Brewster voters will take up Articles 13, 14 and 15, all of which could dramatically affect how Brewster moves forward in the new regulated and taxed cannabis system in Massachusetts. Articles 13 & 14 would permanently ban legal cannabis sales in Brewster, and would even ban non-retail facilities such as testing labs. Article 15 would impose restrictions beyond state law and will likely be judged unconstitutional. Marijuana is already in Brewster and it has been for decades. On December 3, voters will determine whether criminals--who don’t check IDs and don’t conduct any safety checks on their product--should control the market, or whether that power should be given to taxpaying, ID-checking businesses, under the direct control of state regulators and local officials. Articles 13, 14 and 15 won’t keep marijuana out of Brewster. They will simply guarantee that criminals remain in control of marijuana commerce. More and more medical cannabis patients do no want to spend the money for a medical card (with a high annual fee) and do not want their names on a state list. They want to be able to purchase tested therapeutic cannabis just as they can purchase non-prescription medicine at CVS. The ban would prevent them from enjoying the same convenience as other consumers. In Yarmouth last year, first responders were exposed to the deadly drug Fentanyl while responding to an overdose call involving marijuana laced with Fentanyl. Allowing safe, legal sales of tested product would remove the chances of our first responders and cannabis consumers encountering dangerous chemicals from untested product sold by gangs and cartels. Demand of cannabis has been strong for decades. That demand should be met with safe, tested product sold by regulated businesses, not by street dealers. Brewster is facing a significant fiscal challenge. There is a projected $583,000 annual assessment for the Nauset Regional High School renovation AND a projected $382,000 annual assessment for the new Cape Cod Tech school. A new tax revenue stream would help the town meet these steep costs. State law allows towns to tax cannabis facilities at 6 percent on gross sales. With the average Massachusetts medical marijuana dispensaries gross annual sales of $7 million, this would mean $420,000 per year in new revenues for Brewster from a single cannabis retail location. At $420,000 per year, a cannabis facility would be the second-largest taxpayer in Brewster, just behind Ocean Edge at $475,000 per year. Reason #6 — Legal cannabis is working in other states. Colorado, California, Nevada, Washington, Oregon, Michigan and other states have safe, legal cannabis sales systems that have displaced the illicit market, guaranteed safe and tested product for consumers, and generated hundreds of millions in new revenues for state and local governments. Teen use has not increased, nor have traffic crashes due to cannabis impairment. It's simply the smart & safe approach. We aren't advocating for the legalization of recreational cannabis. That already happened in 2016. 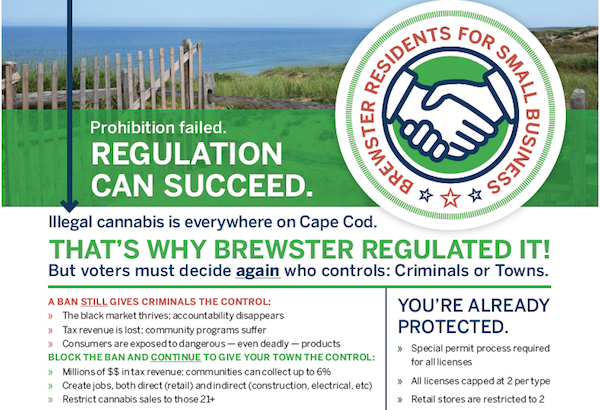 While not all of us voted for it, we do all accept the reality that illegal sales are occurring everyday on the Cape. We're local residents, business people, former town administrators and retired law enforcement, advocating for smart, safe, taxed & regulated cannabis on Cape Cod. And if you have a few minutes, advance the below video to 46:24 and hear directly from The Haven Center on how they will positively impact the Town of Brewster.